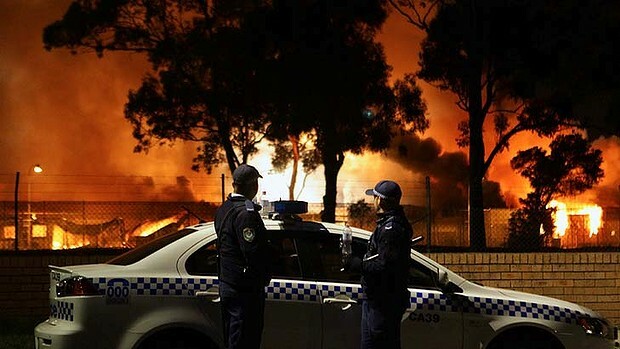 June 28: Four asylum seekers who took part in a violent uprising which caused $9 million in damage to the Villawood detention centre have been jailed for their parts in the 2011 riots. Serco’s detention centre staff were pelted with roof tiles and threatened with uprooted soccer goalposts as detainees repeatedly chanted “freedom’’ during the wild protests, the Supreme Court heard today. Several asylum seekers were also heard shouting: “F… Australia, f… immigration, f… Serco”. Justice Robert Hulme this morning said he accepted the men’s behaviour was born out of “frustration and despair” at being held in the centre, but that didn’t excuse “mob violence”. “Nobody can question that there is a right to protest, but the use of violence is completely unacceptable,” he said. The four men, Mohammed Naim Amiri, Taleb Feili, Majid Parhizar and Ali Haidari, were found guilty of rioting during a trial earlier this year in which 12 Iraqi and Afghani asylum seekers were initially accused of the crime. 21 April: A Papua New Guinea man has died after plummeting from the fifth floor of a southwest Sydney hospital where he was being treated after attempting to harm himself in an immigration detention centre. Police spent more than two hours trying to negotiate with the 33-year-old, who they say was trying to throw himself out of the window at Liverpool Hospital. A police spokesman said the man was believed to be from PNG and was in Australia illegally. An immigration department spokeswoman later said the man had been awaiting deportation. He had been taken to hospital from Sydney’s Villawood detention centre where he had attempted self-harm. The man fell from a ledge outside the window at around 11.30am (AEST) on Saturday and was pronounced dead at the scene. April 17: FOUR men have been found guilty of rioting at the Villawood Detention Centre in 2011 when three buildings were burnt down and pillows and bins set alight. Twelve men went on trial in February, after being charged with riot and affray at the centre in Sydney’s southwest on April 20, while another was accused of aiding and abetting them. On Wednesday a jury found four of the men guilty of rioting. April 7: Three asylum seekers who wanted their plight noticed by the United Nations have been jailed for their part in a fire and riot at Villawood detention centre that caused $9 million of damage. In sentencing the men, Justice Robert Hulme took into account their depression, anxiety and post-traumatic stress disorder. Two of the men had witnessed multiple suicides while in detention, the NSW Supreme Court heard. 7 December: A Villawood detainee who sprayed and threw fire extinguishers at security officers during a riot at the immigration detention centre has been sentenced to at least 16 months’ jail. However, Mahmoud Reza Dadash has already served his minimum sentence and should be immediately released on parole, a NSW Supreme Court judge has ordered. He is expected to be deported to his home country of Iran, after applying to return to the country. Justice Robert Allan Hulme on Friday sentenced Dadash, 28, to a maximum of 21 months for his part in the “particularly nasty” riot on April 20 last year. Dadash had pleaded guilty to affray over his part in the riot, which led to nine buildings at the centre being destroyed by fire. 16 November: Three Fijian nationals have ended their rooftop protest at Villawood detention centre near Sydney, Australia. Australia’s immigration department says that police and authorities successfully talked two people down yesterday afternoon. The third man had ended his protest the previous night, without being offered any concessions. All three were said to be in good health and were being cared for at the centre. Australian media reported that the protest was started by the woman, who feared her deportation was imminent.